Welcome to Music-Paper.com. 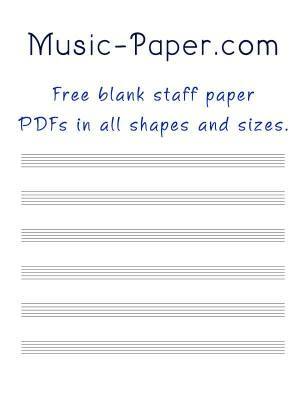 The site features over 100 different versions of free blank sheet music. Select any of the quick links below for free PDFs that you can print out for your own compositions, exercises, or assignments. Scroll down further for links to many more choices of blank staff paper, as well as an explanation of staff paper. 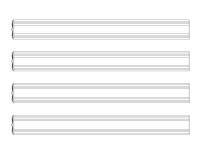 If you don’t need images to make your selection, see the table of contents which lists all of the versions of blank sheet music available on the site. What is Music Staff Paper? 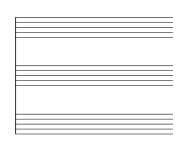 Written music is communicated from one musician to another on sheet music. 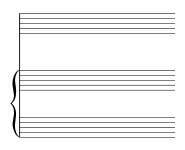 The staff (the plural is staves) is a group of five parallel lines that run horizontally across pages of sheet music. Staves provide us with a framework on which we can write pitches, rhythms, and other symbols to represent music. 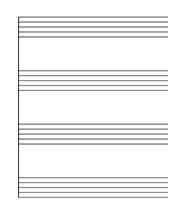 The Free Staff Paper page has PDFs with several different staff sizes and different numbers of staves per page. Feel free to print as many copies of the pages as you like. You can use the blank sheet music paper to compose your own music, make a journal of your musical ideas, write out scales or technical exercises, work on music theory homework, or anything else you can imagine. The page also includes other styles of staff paper, including percussion staves and pages with margins at the top for written text and titles. Use this page to find the staff paper you need, or use the table of contents, if you do not need reference images. Besides blank staff paper, this site includes instructions on how to draw music notes and symbols. You can learn how to draw notes, ledger lines, clefs, rests, note values, accidentals, time signatures, and other musical symbols.